Tired of running between your job and your apartment to receive your guests? Do you have a season rental accommodation? Would you like to have a trustworthy person to welcome your guests? Are you unable to reply to your e-mails as quickly as you would like? Are you unable to maintain cleaning and maintenance of your apartment? We have the solution for your problems! Have someone always available for your guests - anytime, every day of the week - so you do not have to worry. Our employees have more than two decades of experience in real estate management and customer care service. An alternative, which is getting more and more followers, is the short-term lease, for clients who are passing by the area of ? ?your property (tourists, business travelers) and who prefer apartments to hotels. This modality has some advantages, among which the potential income: The payment of the daily rate is usually higher than the monthly rent (adjusted for the day) and the risk of default is lower. However, it requires a minimum structure, which may include someone responsible for the cleaning service and someone who is responsible for maintaining the equipment and the structure of the property. Did not find the package of services to fit your needs? All you wanted was simply a specific cleaning or a check-in during your vacation? You can order any of our services individually according to your needs. We maintain your apartment and guarantee that your guests will find all equipment in good working order. Washing and ironing of clothes in your apartment. We have two pricing modalities available. Reception of guests, delivery of keys and house tour. 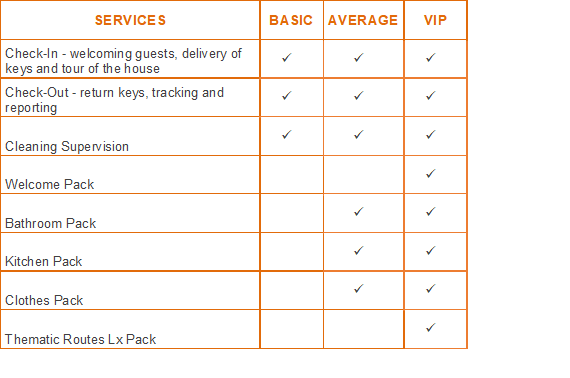 Check-in is when we welcome guests, we can provide you with some indications / information relevant to their stay. We welcome the guests and explain the details of the house and how to work the equipment in it. We try to be creative and personalize the products according to the type of customer. Our packages are handcrafted and can contain wine, coffee, snacks, chocolates, sweets or regional cakes to welcome your guests. Kitchen paper and sponge for the dishes. Other than from scheduling tuk tuk tours and panoramic buses, we give to your guests a unique experience through thematic itineraries viewpoints, museums and monuments, or experiences of the city, according to their interests. We also have personalized itineraries if requested 1 month in advance. Returning of keys, tracking and reporting. We send a detailed report to the home owner. Many home owners have their own cleaning service. However, we like to do final check and touch.